You know it stays hot even through September and people find all sorts of ways to keep cool, but what about our animals? How should we keep them cool? Yes, even into the fall thousands of dogs find their way into the family veterinary office or even the emergency room after spending just a few hours in the hot sun. For those of us in warm states, such as Florida.. we see these cases nearly all year 'round. DPC Veterinary Hospital wants to make sure all of our clients are fully informed on the symptoms and dangers of heat stroke in dogs. As most people know, dogs don’t sweat like we do; they most often cool themselves by panting. Anything that inhibits that natural cooling system can lead to heat stroke. Normally a dog’s temperature ranges from 100 to 102.5. In cases of heat stroke, temperatures over 106 degrees are considered to be an emergency, and temperatures over 110 degrees can be fatal in less than 15 minutes. Use cool, not cold, tap water on the extremities. This will help effectively lower the body temperature. Do not use ice or extremely cold water. While this may seem logical, extreme cold water will cause the surface blood vessels to contract, forming an insulated area that traps heat in the body and literally stops the cooling of these vital internal organs. 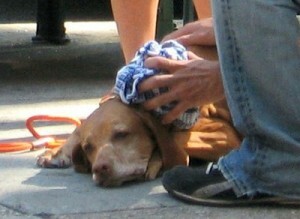 Without these life savings steps, many dogs could lose their lives to a simple hot day. Then load you pet carefully into the car quickly and get your pet to the veterinarian office. If your pet is displaying any of these symptoms, please call us at 954-989-9879 immediately!